It was with some trepidation that I approached this new FdM single given my negative reaction to Nick Nicely’s 2014 album Space of a Second. Always wanting to give the benefit of the doubt and keep an open mind, I was pleasantly surprised with 49 Cigars. Actually, the title cut is the b side of nick nicely’s “Hilly Fields” single released in 1982. “49 Cigars,” which by the way has nothing at all to do with cigars, is a psychedelic masterpiece and reminds me a bit of George Harrison’s Indian-influenced songs. Since FdM wanted to make this new single a little different, Nick dug into his archives and provided an exclusive live recording of “49 Cigars.” But there is no information provided for when this song was performed. The live cut is an extended version with a lot of distortion. Given Nick’s penchant for processing his tracks, he could have purposefully modified the recording to achieve this sound. The live version shows a different side to the music and there is some odd falsetto singing at the end. 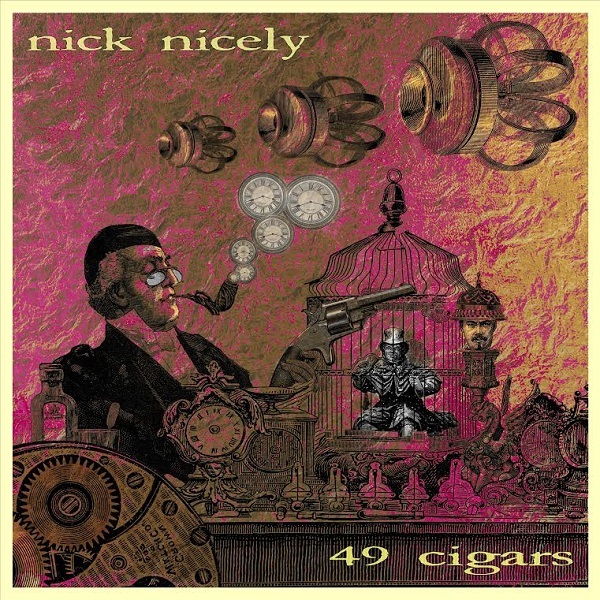 Not satisfied with two versions of “49 Cigars,” Keith Jones asked if FdM could include “Belinda” from Nick's next album and “Lobster Dobbs” from 2014 to round things out. Nick remixed this version of “Belinda." There are distorted vocals and crazy shifts in rhythm and music. I also detect some Mellotron buried down in the mix. I cannot tell for sure, but I think that Nick left the mix of “Lobster Dobbs” alone. So the resulting EP is kind of like the bride’s gifts: something old, something new, something borrowed, something blue.